Ostraca (ink inscriptions on clay) from the Iron Age fortress of Arad, located in arid southern Judah. These documents are dated to the latest phase of the First Temple Period in Judah, ca. 600 BCE. The texts represent correspondence of local military personnel. The research engaged new document analysis algorithms aimed at identifying different writers. It detected at least six contemporaneous authors within a corpus of 16 inscriptions. This indicates a high literacy level within the Judahite administration and provides a possible stage-setting for compilation of biblical texts. Credit: Michael Cordonsky (photographer), Tel Aviv University and the Israel Antiquities Authority. Scholars have long debated how much of the Hebrew bible was composed before the destruction of Jerusalem and the Kingdom of Judah in 586 BCE. While scholars agree that key biblical texts were written starting in the 7th century BCE, the exact date of the compilation of these books remains in question. A new Tel Aviv University study published today in PNAS suggests that widespread literacy was required for this massive undertaking and provides empirical evidence of that literacy in the final days of the Kingdom of Judah. A profusion of literate individuals in Judah may have set the stage for the compilation of biblical works that constitute the basis of Judahite history and theology, such as the early version of the books of Deuteronomy to Second Kings, according to the researchers. "There's a heated discussion regarding the timing of the composition of a critical mass of biblical texts," said Prof. Israel Finkelstein of TAU's Department of Archaeology and Ancient Near Eastern Civilizations, who led the research together with Prof. Eliezer Piasetzky of TAU's School of Physics and Astronomy. "But to answer this, one must ask a broader question: What were the literacy rates in Judah at the end of the First Temple period? And what were the literacy rates later on, under Persian rule?" The interdisciplinary study was conducted by Shira Faigenbaum-Golovin, Arie Shaus and Barak Sober, under the supervision of Prof. Eli Turkel and Prof. David Levin, all of TAU's Department of Applied Mathematics. Other collaborators included Prof. Nadav Na'aman of TAU's Department of Jewish History and Prof. Benjamin Sass of TAU's Department of Archaeology and Ancient Near Eastern Civilizations. Using cutting-edge computerized image processing and machine learning tools, the TAU team analyzed 16 inscriptions unearthed at an excavation in the remote fort of Arad, and deduced that the texts had been written by at least six authors. The content of the inscriptions disclosed that reading and writing abilities existed throughout the military chain of command, from the highest echelon all the way down to the deputy quartermaster of the fort. "We designed an algorithm to distinguish between different authors, then composed a statistical mechanism to assess our findings," said Sober. "Through probability analysis, we eliminated the likelihood that the texts were written by a single author." The inscriptions found at Arad consisted of instructions for troop movements and the registration of expenses for food. The tone and nature of the commands precluded the role of professional scribes. Considering the remoteness of Arad, the small garrison stationed there, and the narrow time period of the inscriptions, this finding indicates a high literacy rate within Judah's administrative apparatus—and provides a suitable background for the composition of a critical mass of biblical texts. "We found indirect evidence of the existence of an educational infrastructure, which could have enabled the composition of biblical texts," said Prof. Piasetzky. "Literacy existed at all levels of the administrative, military and priestly systems of Judah. Reading and writing were not limited to a tiny elite." "Now our job is to extrapolate from Arad to a broader area," said Prof. Finkelstein. 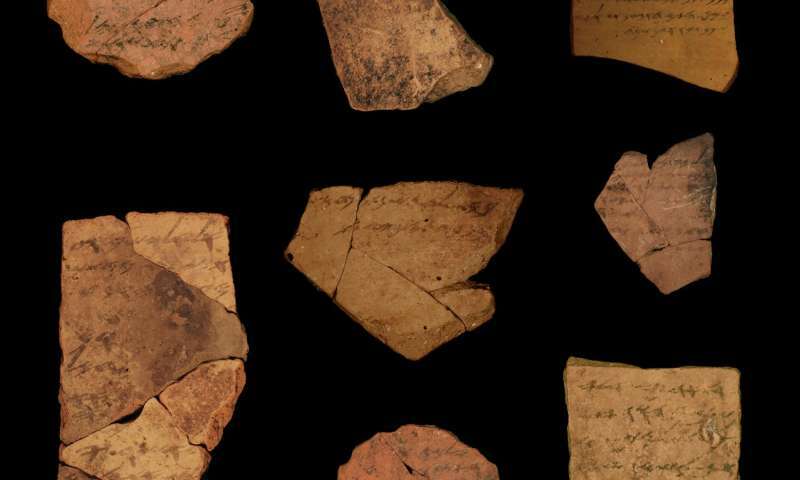 "Adding what we know about Arad to other forts and administrative localities across ancient Judah, we can estimate that many people could read and write during the last phase of the First Temple period. We assume that in a kingdom of some 100,000 people, at least several hundred were literate. "Following the fall of Judah, there was a large gap in production of Hebrew inscriptions until the second century BCE, the next period with evidence for widespread literacy. This reduces the odds for a compilation of substantial Biblical literature in Jerusalem between ca. 586 and 200 BCE." "Scholars have long debated how much of the Hebrew bible was composed before the destruction of Jerusalem and the Kingdom of Judah in 586 BCE. " There is no such thing as Hebrew bible. In fact the Bible is composed from old and new testament which are inextricably linked and can not be separate. In old testament God explain the reason for the creation of the heaven and the Earth and life in it, the reason for the original sin and the fallen people, all important prophecies for the camming of the Savior - Jesus Christ the Son of God and for the edn times - in the book of Daniel . The new testament reveal the way for the slavation and important prophecies for the end time which are in full harmony with those from the old testament. This is typical of 'biblical' scholars trying to push a preset agenda on the evidence. The historical evidence of the religious texts that went into the judaist and later christianist myth texts is clearly exposed by the Dead Sea scrolls, that show the myth is recent @ 2,3 kyrs ago and that the sects were numerous. Something that the first historian of the area, Josephus confirms, the judaist sect was one of four @ 1.9 kyrs ago, with no real connection to the Judah state except the area name and possibly heredity. The found military texts, without a smidgen of religious myth content, tests the above historically based theory well, and rejects the 'biblical' scholar story. (This has a parallel in mohammedanist scholars, that have found early military texts of border conquests and wants to connect the aggression to the religion, instead of realizing the missing religious content.) Yet again, but oy vey, are they blind to evidence! so that kinda sinks your personal opinion about reality, doesn't it?